Just like in other cultures, the Emperors of ancient China sought to maximize their power. Therefore, they would try to harness all means in order to ensure the longevity of their health, power and reign, even studying the laws of nature. They would seek all means of protection so that their kingdom would also benefit. In ancient times, scholars would study the terrain, directional aspects, seasons and even the celestial constellations. The information gathered would then be used when positioning and designing palaces, tombs and even when scheduling various important rituals. These scholars and practitioners are known as geomancers. What used to be practiced by royalty trickled down to the landowners and other wealthy in the land. 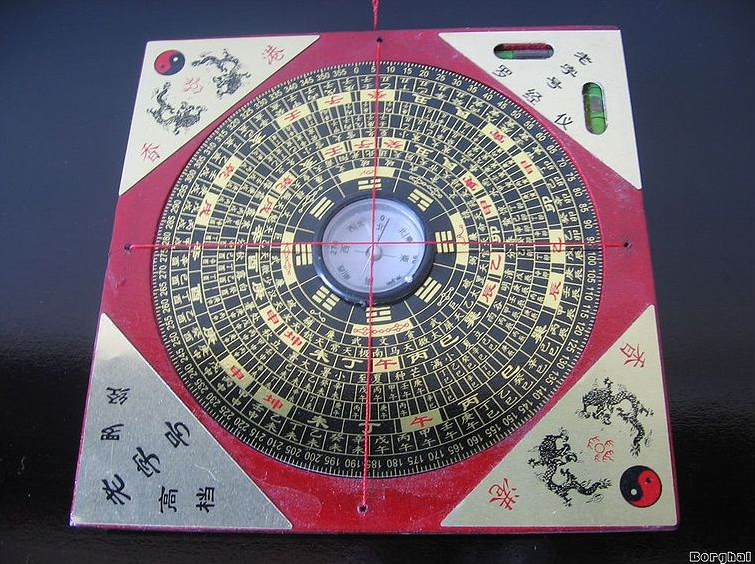 Soon, the entire Chinese nation would also practice and use the principles of feng shui. Today, the practice has spread to various parts of the world. The principles are largely the same as they were 3,000 years ago, even if the overall landscape has changed in modern times. Feng shui is literally translated to wind-water. In it’s most basic sense, feng shui is a way of understanding the universe. The practice is a way of explaining and showing the interrelatedness of things and how everything has energy. It is both art and science that relate to balancing the energy of a given space to ensure the good health, prosperity and overall wellbeing of its occupants. It may be hard to believe that what direction you face will influence your overall health. However, it at least pays to understand what this is all about so that you can still harness the benefits, even if you may not necessarily believe in it. To gain a better appreciation of the practice, it’s a good idea to learn more about it. Here are some basic concepts and what they mean in the context of feng shui. This is the most basic concept of feng shui. It stems from the Taoist view that all living things give off and have chi or energy. Chi is therefore, the intrinsic energy of all living things. Chi is manipulated in various ways. A person’s personal chi may be changed through exercise such as in the form of Tai-Chi or acupuncture, and of course, through feng shui. There is chi in the food we eat, the air we breathe and people we interact with and the places where we spend our time. To have good chi is to have good health. It is also the presence of good chi that attracts wealth, prosperity and all the other things that make us happy. There is always a counterpart to everything, such as light and dark, young and old and so forth. 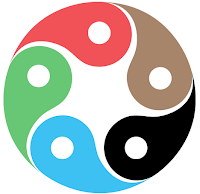 In feng shui, yin is the female aspect, while yang refers to the male aspect. 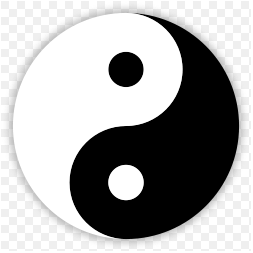 Yin is associated with the dark, moon, cold and water. On the other hand, yang is associated with light, sun, hot, day and fire. One is not necessarily better than the other since both are needed. It is through the practice of feng shui that yin and yang are effectively balanced. Chi or energy is thought to have functions or frequencies. These are metal, water, wood, fire and earth. Everything goes through a natural cycle, just as the seasons change. However, disrupting this natural cycle of creation and destruction is what is referred to as imbalance. This results in pain, disease and other misfortunes. Representation of the Chinese five elements (wǔxíng) with text in english. 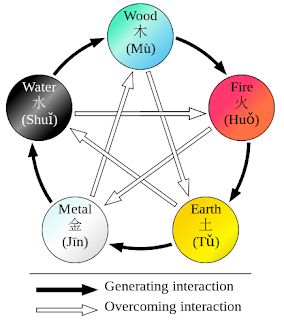 The five elements can be seen in its literal sense. For example, a fireplace literally is the fire element. However, it can also refer to an object showing the similarities with or exhibiting the energy of the main element. For example, a mirror is a water element, though it is not necessarily made of water. It however, reflects things. Wu xing is important because these elements are manipulated in order to create or destroy a particular cycle when trying to enhance chi. For example, in feng shui, metal destroys wood, because metal can literally chop wood. On the other hand, water creates wood because water is needed to nurture plants and trees. A ba-gua is often placed over the door of a Chinese home. 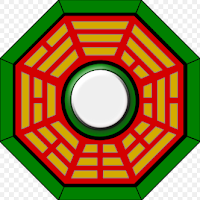 The red octagon shaped object is actually a very powerful symbol and tool used by geomancers in feng shui. 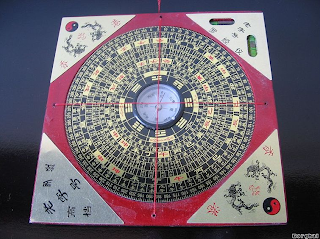 The eight sectors or gua correspond with 45 degrees of a compass. Each section refers to a corresponding direction, a specific element, a season, planetary influence, color and family member. The grid also has various symbols found in the I Ching, which is the ancient Chinese book of divination. For the Chinese, the orientation of the gua is placed at the bottom while the top of the gua faces the south. For westerners, the north is placed on the top while the south corresponds to the bottom of the gua. There are so many other aspects about feng shui but this just provides the most basic overview of some words and concepts often used. Regardless of whether you believe in it or choose to practice it, the principles behind have taken root in the consciousness of so many people across the globe. Whether you are seeking prosperity or long life, or you simply want to decorate your space in the most harmonious way possible, feng shui teaches us that it can be done by working with the space and energy that we have. There are so many things which can be understand easily. The blog posting services are actually what that describe languages also. Thank you for sharing the post!! It's so interesting. Feng Shui is a process that affects your internal landscape just as much as it affects your physical environment. In order for your spirit to be nourished by the enhancements you make to your home, you must start the entire process by looking inward, and this is an important Feng Shui tip that most Feng Shui consultants like me would offer to all Feng Shui beginners. This in fact is the essence of spiritual Feng Shui which looks at the Feng Shui at a higher level than the other types of Feng Shui which mostly aim at improving at a niche level; be it your office, home or bedroom Feng Shui 2019 : Make the Most of your Luck in the Year of the Earth Boar.